Designed for large power requirements, the Go Power!™ GP-1750HD (Heavy Duty) modified sine wave inverter is suitable for powering most standard AC appliances. 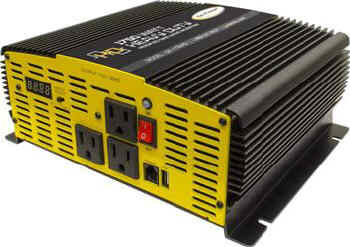 Silent, lightweight and easy to use, the GP-1750HD can provide electricity for your RV, boat, truck or even your home as a source of backup power. Features include complete overload protection, low-battery alarms, low-battery shutdown and an optional remote control. Within the "Intelligent Control System" an LED bar graph display shows battery voltage and inverter draw, and lights indicate over-temperature or over-load conditions.